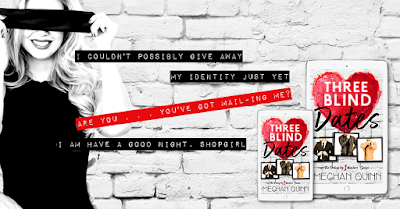 Meghan Quinn is one author I can guarantee will make me laugh, even if she doesn’t mean to and while Three Blind Dates is a Rom-Com the laughs were plentiful, the swoon factor was ever present and the plot was addictive and unputdownable. Meghan Quinn is one of my one click authors, no matter the book she always seems to tick all my boxes and once again she has hit the jackpot, 5 glorious stars. Our heroine is in a position a lot of us will have experienced, single, getting older, wants to settle down and yet cannot find the time or any decent men to dip her toe into the dating pool again. 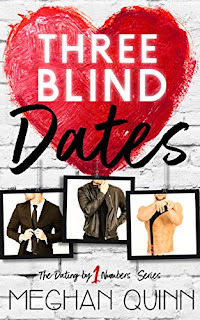 With a new app on the market that guarantees to find you “your one” was an opportunity that she could not turn down and so begins her Three Blind Dates. Noely is a co-host on morning TV and between work, her schedule and the fact she is well known, she still finds herself one hundred percent single. Wanting more from her single existence, when the app “Going in Blind” goes live she sees this as her opportunity to find her love of a life time and with the app setting up the dates, basing matches on compatibility, both emotionally and on personality and boasting a high success rate, she goes all in. Noely finds herself on three blind dates, we have The Suit, The Rebel and The Jock. I am not going to go into the dates or anything as you need to read how each pans out and the fun and shenanigans that each entail, but for once, I was on the winning team. As ever, Meghan Quinn brings her own brand of humour to Three Blind Dates and writes a story that any single woman, both past and present, can relate to. This book was full of fun, wit and was downright swoon worthy as three men, that were all amazing in their own right, fight for their chance to make Noely, their one. With some great secondary characters that will literally have you peeing yourself laughing, I loved everything about this book and the fact that the two men that didn’t get the girl get their own book is music to my ears. With this dating app, I cannot wait to see who these amazing guys end up with.